The Traditional Notepac Deluxe SafePORT Notebook Case now offers even more. 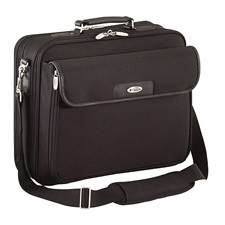 It includes a larger front pocket to accommodate folders and documents. Features that have been added to the front zip-down workstation include pen loops, large mesh pocket, key clip, business card holder, and phone pocket putting your most commonly used items together and in easy reach. Increased storage has also been added to the main compartment with the addition of two pockets for accessory storage, a slip pocket for files as well as scratch resistant sleeves to hold 3 CD/DVDs. Other improvements include a better padded and longer shoulder strap, metal Targus logo, grey accent Targus lining, upgraded nickel hardware and newly designed zipper pulls making this case more attractive and functional than ever before. Padded notebook compartment fits notebooks with screen sizes up to 15?? ?